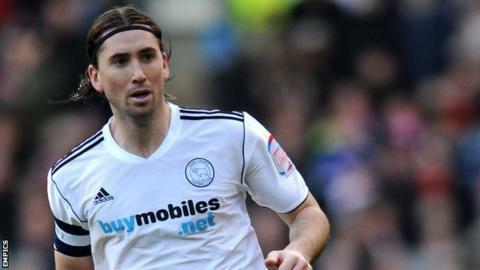 Derby County captain Shaun Barker says the career-threatening injury that has sidelined him for nearly a year has given him a new perspective. The defender, 30, dislocated his right kneecap and suffered ligament damage against Nottingham Forest in mid-March. But he has now started a rehabilitation programme in the swimming pool after undergoing three operations and is still on course to return in September. "The longer it is the more special it will be," he BBC East Midlands Today. "It will make me appreciate it more - the beauty of the game and how lucky I am to play for such a big side. It will take lot of resilience, patience and a strong mental attitude to keep going forward - in a weird way I relish it. "Getting into the pool is a nice step forward for me - it has been good to get away from Moor Farm and the physios' faces. "It is nice to do a bit of exercise, I've been off my feet for 11 months now." Barker has always maintained that he would return to action for the Rams, having successfully come back from a serious knee injury in the past. He was out for seven months in 2011 after needing surgery to address a knee problem that affected his training. "I'm desperate to get back and I'm sure I will get there," Barker said. "It will take lot of resilience and patience and a strong mental attitude to keep going forward - in a weird way I relish it. "It is the thought of playing at Pride Park again that helps me." The central-defender signed the contract extension with the Rams six months after his injury, which will keep keep him at Pride Park until 2015.